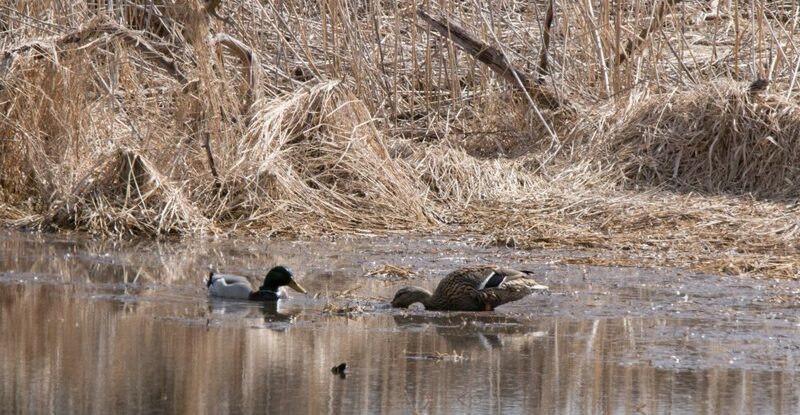 This entry was posted in birding and tagged Black-Capped Chickadee, Blue-Winged Teal, Bufflehead, Greater Scaup, Lesser Scaup, McGinnis Slough, Sandhille Cranes, Trumpeter Swan by Lisa Rest. Bookmark the permalink. Thanks, Lisa. Last Saturday we were in Downers Grove visiting a daughter. We had a similar sandhill experience. there were hundreds of them joining up and circling at a relatively low altitude. It was a treat that lasted for some time. We’ve never seen that many at one time. Thanks, Jim! Your description is perfect. I think it was longer than ten or fifteen minutes, but I was so mesmerized I didn’t even think to record their sound when they were right overhead. The only other time I have ever seen this many is at Jasper-Pulaski in the fall-winter migration when they come in to their staging area. For birds that dance on the ground, I think one could say they were dancing in the air over McGinnis. I will have to go back when the trail dries up and see if any are staying there as in previous years I have seen a couple. What an excellent visit. Your photographs were most enjoyable. Wonderful sightings and captures, Lisa! Thanks, Donna! I was thinking about going back tomorrow afternoon but we got more rain so maybe not just yet! Exciting to see all those Sandhill Cranes. Glad the flooding wasn’t so bad. Actually if not for the flooding I never would’ve seen the swans. My boots have a fine coating of McGinnis mud but it’s okay. I think it will be awhile before the trail has fully recovered.